Dynacord is expanding its vertical array systems to include the TS 100 and TS 200 cabinets, which embrace the production quality typical of goods "Made in Germany". Ultra-compact and equipped with high-quality components, the two-way systems deliver sound of outstanding intelligibility as well as achieving even, controlled dispersion over the entire frequency range. Whether used for small family parties or a big gala reception – the vertical array systems represent the best sound entertainment with minimum effort. The attractive, yet discrete styling makes them a perfect choice for the integration in a multitude of environments. The range of accessories includes kits for both, truss and wall-mounting as well as a practical carrying bag. 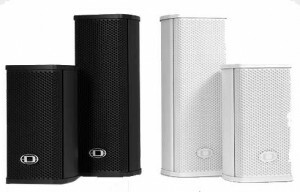 The PowerSub 312 and the Sub 112 had a face-lifted in order to match the range of Vertical Array Systems thus extending the line of available sub woofers from 18" and 15" to 12" versions.